Adding a walkway or path to your yard is a great way to make your landscape accessible and add an element of interest to your home’s outdoor design. Natural stone walkways are a rising trend among homeowners, even over the classic and traditional brick walkways that many people are familiar with—and it’s not hard to see why. Bluestone is one material that has been a go-to for decades, because the wide range of shapes, colors and styles presents limitless opportunities for creativity. You can complement your home’s exterior or create an entirely unique outdoor space. 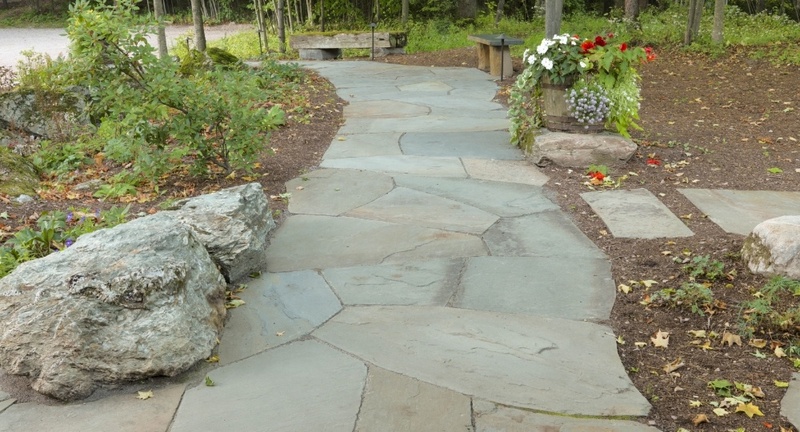 Though bluestone only comes from a specific region in the northeastern United States, its versatility makes it ideal for a large variety of applications. This natural stone can be made into pavers of a uniform size or broken into mismatched pieces for a natural look, making it ideal for walkways of any design. Many people who hear “bluestone” may be under the impression that it only comes in blue. Actually, bluestone comes in a wide variety of colors: from deep blue to ice blue, lilac to purple, earthy greens, and even rust. The natural stone has unique striations and color gradients that add a level of artistry to your landscape. When properly sealed, bluestone can withstand the dangers of the yearly winter and summer temperature changes we experience in the Northeast. Sealed bluestone works particularly well for walkways that wind around foundations and swimming pools. It’s commonly used in this region because of its high availability. The shapes in this stone are what make this walkway so appealing. The owners of this property were clearly going for a natural look that would complement both the stone walls of their raised patio and the exterior colors of their home. The result is a wide, inviting walkway that looks right at home in this beautiful setting. The design of this driveway and walkway stand out because of the unique combination of bluestone and concrete pavers. 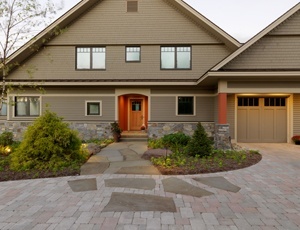 The interesting shapes of the bluestone on the driveway create a transition to the walkway leading to the front door. 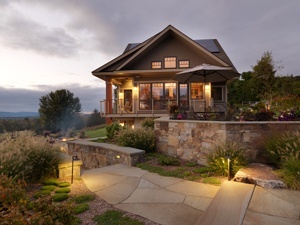 These two separate elements of the yard become one cohesive design, bringing balance to the front of the home. The term “natural cleft” refers to a texture choice you have when picking bluestone. A natural cleft surface is created by sawing blocks of bluestone out of the ground and splitting them on visible seams, giving the stone a natural texture. 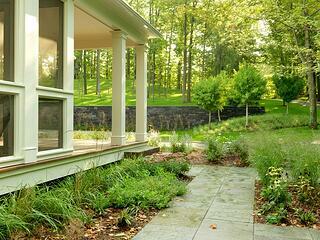 This bluestone walkway winds invitingly around the perimeter of the house. For people who value the texture of natural stone, a natural cleft bluestone may be the right choice. If you’re interested in a square or rectangle shape, another extremely popular choice is thermal bluestone. The thermal finish is a flamed finish that creates a flat surface with a grit-like texture. 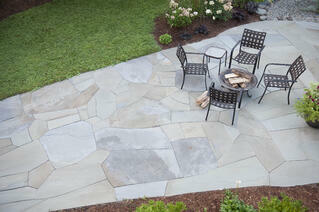 This product is an ideal bluestone for modern home or commercial settings. The flat grit-like surface yields a much more consistent thickness than natural cleft bluestone which makes thermal bluestone much easier to install. This beautiful walkway, like the first one on this post, is set in a mosaic pattern where each piece is fit together like a puzzle forming a mosaic pattern. The color variations in this walkway make for a truly eye-catching element in the yard, and the curvature that is achieved with the stone shapes helps add an air of elegance. Want even more creative ideas for your yard?